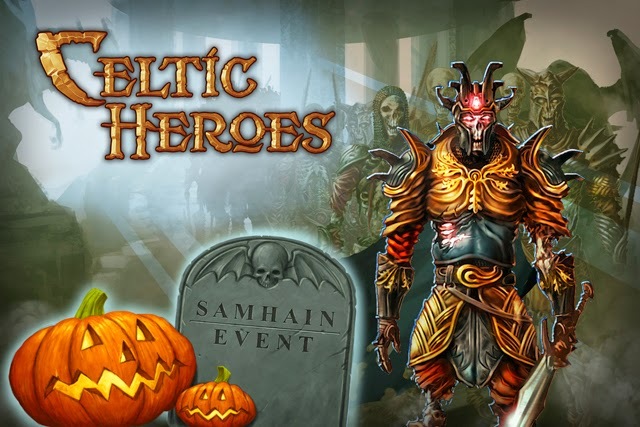 This is your guide to the Samhain 2012 Halloween event in Celtic Heroes that was from October 30, 2012 to December 19, 2012. I'll be showing you new bosses, quests, luxury items, mounts, fashion, and mobs along with maps and info about each part of the event. King Vorum Dreadbone (140/6*)A giant skeleton boss that sat at the end of the Northern Penninsula in Lir's Reach. His signature skill was the Eight Flames of Doom, where he would shoot 8 fireballs at random people in the area. This boss drops 3 items. He continues to show up as a rare spawn in Lir's Reach after the event ended, but he was moved to the beach area West of the Skullcrusher Camp. Same type of boss as Vorum, except a little easier. He only drops one item. Amulets- This boss dropped necklaces that are in the table below. This quest had you collecting orange pumpkins around Lir's Reach. There were 7 witches around Lir's Reach giving quests for different color hats. The first witch took 10 pumpkins for a red hat. The second witch took 3 red hats for a pink one, the third took 3 pinks for a yellow, and so on. See the chart below to see more details about the quest. The blue, purple, and white hats sparkle. The white coven hat is one of the rarest in the game due to the fact that it's old and the quest was difficult so not many people got this hat. There were witches flying around Lir's Reach that dropped Witches Brew. If you turn in 10 witches Brews to the quest giver in the tavern, you get a Cane of Bats. If you do this 5 times, you can turn in your 5 Canes of Bats for a Grand Cane of Bats. Both types shoot projectiles that look like bats, but the Grand version sparkles. This armor set was gotten from quests in Lir's Reach by defeating undead bosses in a daily quest. See the video below for more details. These quests were kept in the game after the event ended due to popular demand. They were greatly changed in he release of the Destiny Engine Update. Click Here to See the New Duskshadow Armor Guide. This armor set was gotten from quests in Stonevale by defeating undead bosses in a daily quest. See the video below for more details. These quests were kept in the game after the event ended due to popular demand. They were greatly changed in he release of the Destiny Engine Update. Click Here to See the New Darkshadow Armor Guide. This armor set was gotten from quests in the otherworld by defeating undead bosses in a daily quest. See the video below for more details. These quests were kept in the game after the event ended due to popular demand. They were greatly changed in he release of the Destiny Engine Update. Click Here to See the New Spiritshadow Armor Guide. Batmask mobs are special mobs that spawned around the world, and dropped Bat Mask head armor. They were kept in the game as rare spawn mobs after the event ended. See the video below for information on how to get a Bat Mask. There was a shop where you could buy charms that made you look like skeletons or zombies. There was a flaming skeleton charm that set your head on fire, and others that made you look like the zombie bosses from the Samhain armor quests. The most expensive was the skeleton king charm that made you look like Vorum Dreadbone. See the video below for more shop details. There was a shop where you could buy charms that made you look like wraiths. There were different colors, and sparkling and non-sparkling versions. The most expensive was the skeleton king charm that made you look like a sparkling Shivercowl. See the video below for more shop details. The witch fashion shop gave female characters another option for clothes, allowing them to buy red, black, and white coven fashion. This shop was kept in the game after the event ended, and is still there to this day. See the video below for more shop details. The mounts for this event were brooms, the most expensive being the divine brooms. To see these in the shops, you needed to have a certain amount of gold, which is why in the video below they are not featured. The divine brooms came in three variations: Embers that had fire on the end of the broom, Winter that had ice particles on the end of the broom, and Magic which had sparkles on the end of the broom. See the video below for more shop details.